Mild Magazine is free blogger template for magazine style. Mild Magazine is a simple, clean, modern and professional blog ideal for making a professional blogging and elegant websites. This template is totally responsive so it adapts to your style as well as the device it’s viewed on. It is clean and fresh style and high user friendly blogger template. Mild Magazine created by Herdiansyah Hamzah and published on this site. Mild Magazine features include responsive design, smart thumbnail resize, 2 label magazine style, responsive menu navigation, label cloud edited, feedburner subscribe, page navigation number, popular post edited, 2 column layout, white color background, comment edited, standart SEO ready, share social media button on homepage/postpage and well documentation on PDF version. 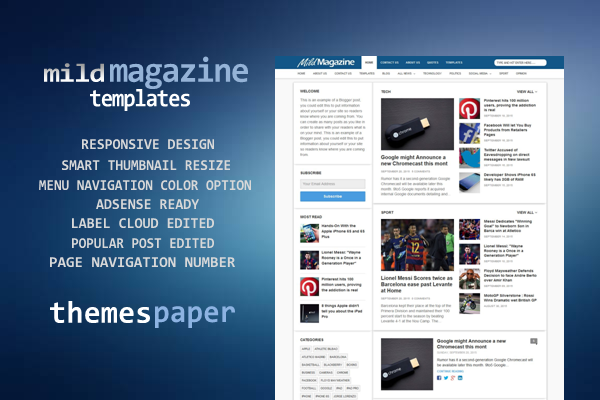 Mild Magazine is free template from Themes Paper, but you can choose premium option Only $6, has advantages such as you can remove footer link credits, no encrypted scripts, uncompressed CSS, you can use for unlimited domain, you will get lifetime templates updates and lifetime premium support from us. You can buy this premium version with PayPal button below and please confirm to themespaper [at] gmail.com after transaction. Yup, sama2. Semoga bermanfaat. Btw, untuk request template tempo hari belum kelar. Masih berusaha nyuri2 waktu buat ngerjain. Sabar ya. Bagus bgt template nya bang Herdi , Ditunggu template yang lain nya ya bang . Terimakasih, semoga bermanfaat. Oke, template2 berikutnya akan diusahakan lebih baik. I want to buy this theme for my blog. Hi Kashish, just click buy now button at the bottom of posts, and do not forget confirm to themespaper [at] gmail.com after transaction. this is Khaleel,i am from from India. i like this theme, i want to buy this theme premium version, but my debit card is not acceptable from paypal, please take me another source. Dear Shaik, for now, we only use Paypal for transaction. Maybe you can borrow your friend paypal account for buy this template premium version. Thank you. For search widget code, open readme file and for navigation code, you can read documentation file. Thank you Mr. Morar. Hope you enjoyed. Thank you, i'll check soon. You're welcome, hope you enjoyed. Gan, Template ini di blog saya kok gak muncul kotak komentar Blogger nya ya? Cuma kotak komentar facebook aja. Mohon maaf, baru sempat buka kolom komentar. Alamat blog mas jumiansyah apa? Biar saya coba cek. Thank you.